It is difficult for the manufacturer to put in the chamfer in any automated method since the accummulation of manufacturing tolerances are built up from the bottom of the skiboard to the top sheet. It would most likely also be a manual process for the manufacturer and it would therefore add a lot of cost. Line skis came out with "Capwall" this year which combines Cap along the top edge and sidewall below the small cap. I'm not sure how well it works but it's a great idea. I will have to dig out a picture I have of a snowboard my daughter had a number of years ago. She may still have it. I believe it used the same construction as the capwall. Yup, other companies have been doing it for a few years now. My 2008 Armada JJ's have this same design. At the tips and tails they are just cap, and then there is a section with sidewall underfoot. I can because I want to. I want to because you said I couldn't. BTW: I like the concept since it is the tips and tails that take the beating on my boards. Here is a picture of the ~ 5 year old K2 snowboard with the hybrid construction. She still has it and it is in great shape. I wanted to add that a sanding sponge, like 3M makes, works great too. I use the short side of it so I don't sand more than the edge. Boards ridden, some owned: Sherpas, Spruce 120 "STS", Blunts, DS110 custom prototypes, Rockered Condors, Revolts, DLPs, Summit Custom 110s, Summit Marauders, Head 94s, Raptor prototypes, Osprey prototypes. I don't know a lot about board construction, but some boards seem to be very susceptible to edge damage and others not. The Summit Customs and Trees I have just seem to crumble at the edges with the slightest touch. They can't even ride in the car without getting nicked. I have to carry clear nail varnish to touch them up at night when we ski two days in a row. The Summits are a little better since I camphered them, but they are still very brittle. On the other hand, the Summit Jades and Spruce 120s never seem to get damaged. The edge seems to finished differently? Perhaps recessed a little from the edge and smoothed over. Much, much better than the other boards. Gets to be a pain having to repair your boards every time you use them. Just these, nothing else ! The edges of my pair of Trees are also crumbled after only using them for 3 weeks. So I'm going to sand them to prevent future damage. The big holes need to be filled with epoxy right? Is nail varnish only a temporary fix or just as good? Boots: Full Tilt "High Five"
Helmet: POC "Skull Light PP edition"
The nail varnish was just a quick fix for trips. I usually sand the edges of the boards and use a quality sealant varnish. Others may have, but I have never tried to fill the chips with epoxy, I just sand them smooth. My Summit Customs got so bad I sanded the entire top sheet and edges and refinished the whole board. How well does this work to prevent "slices" in the sides? After 2 full days of riding my Revolts I have 5 or so good slices where the edges must've hit the top side of the other board. I used clear nail polish the first time around, can anyone recommend a quality epoxy? Try JB Weld. It mixes up to a grey color so it may not be pretty, but it's super effective. 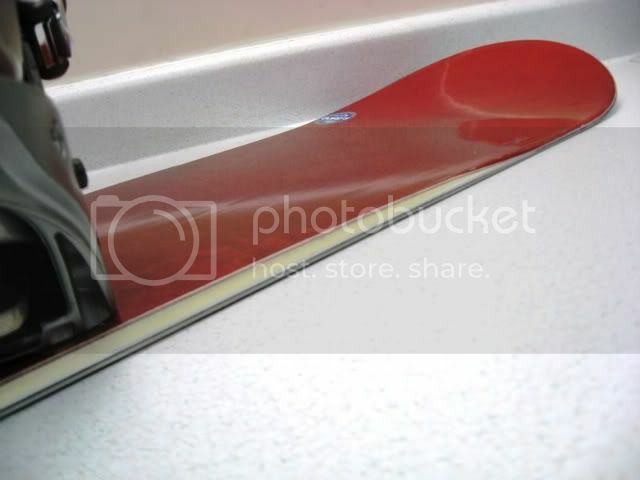 In 2009 my brother had the top sheet of his snowboard peel off while in use. Ended up exposing the wood in an area about the size of a piece of pizza. He hit it with a hair dryer that night at the hotel, used rental gear the rest of the trip, then tossed the busted board into storage when we got back with the intent of turning it into a work bench. It was totally forgotten about until last month when we pulled it out of storage and pasted it back together with JB Weld just for shits and giggles. It's now seen 30 hours of heavy use with no ill effects. This is a problem with sidewall constructed skiboards. The "chamfering" does help. I use a hand sander to do it. The Blunts are sidewall but seem very resistents to edge dings. I think they have different design specifications? A good 24 hour marine grade epoxy from Ace is suitable for most skiboard fixes. Actually, it's a problem with ALL types of construction. Sharp metal edges and soft plastic . . . . only ever going to be one winner. Difference is, with cap construction you can at least repair it to some extent. The difference between the Blunts and other r8 boards is that the sidewalls on the blunts are angled in much more so are a bit more out of harms way. You can do this with other R8 boards if you have the workshop skills. I always do with mine. Most everything else over time.